Welcome to Modern Wild Man! Modern Wild Man is a place to enjoy outdoor adventure stories from the field. Wikipedia defines the Wilderness as, "Wilderness or wildland is a natural environment on Earth that has not been significantly modified by civilized human activity. It may also be defined as: "The most intact, undisturbed wild natural areas left on our planet—those last truly wild places that humans do not control and have not developed with roads, pipelines or other industrial infrastructure."" This blog is a place for those of us who seek that wilderness. As a society and world culture we continue to extend pavement, steel and wire further and further into what was at one time a truly wild place. Many of us feel a type of magnetism to those wild places that are left. We crave time away from our everyday to feel what is real and natural, and to be in a place that is right and good without us being in the center of it. A Wild Man craves the wilderness and the experiences there. Simple things like the smell of the woods, the wind on your face, and the sound of a running stream can fill your soul and bring a sense of wholeness to a man. At Modern Wild Man we hope to bring a sample of some of those things to those who are in between wilderness experiences. Come by often for a collection of wilderness experiences: hunting and gathering, camping and fishing, paddling and campfires. Recipes for game and fish, thoughts on conservation, and the Modern Wild Man. For those of us who find happiness in shooting straight, walking into the wind, and the feel of wild dirt under our boots! We respect our old friends and traditions, and start new. An old cowboy friend shared with me some words of wisdom many years ago. Under a tobacco yellow stained white mustache, he explained to me his theory about dogs and horses. His cowboy wisdom was built on years of experience working and living on the high plains. "In life", he said "You only get one or two good dogs, and maybe as many good horses." Those words seemed to weigh heavy on my ears, and set me to wonder if my friend was right.Years have passed from the horseback afternoons with my cowboy friend, and I can't even say for sure where he is today, but I can vouch for his logic, at least in part. In the spring of 2000 I was bound for a new adventure and journey. I accepted a new job in a new place, and everything in my life was about to change. Always a hunter and outdoor adventurer I was excited for what my new life had in store, the new areas to explore, and new hunts that awaited me. That same spring, a good friend and fellow outdoorsman buddy of mine had a new litter of chocolate labrador puppies that were ready for their new home. It worked out for me that spring that my new adventure included a new best friend. I selected a little roly poly male pup from the litter. His coat was the color of an October acorn, and he quickly grew into his oversized puppy paws. We spent that summer traipsing around the countryside, fishing for largemouth bass, and thinking about ducks in the fall. Duke was by my side everywhere I could take him, and fall couldn't come quick enough. Duke and I on a September teal hunt. Those days were some of our best days, chasing birds without concern for much else. Duke and I hunted pheasants in blizzards, quail in the sunshine, ducks along rivers and lakes, geese in fields, and every other type of bird hunting you can think of. 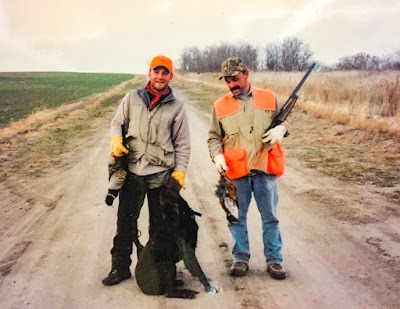 There are stories of live bird retrieves from the field without a shot being fired, long water retrieves for winged gander geese, and amazing upland work in pheasant fields; that I could go on and on with from those seasons. We spent winter weekends on the road sleeping in the truck or in small town hotels in between hunting days. 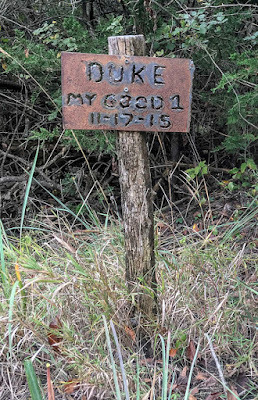 Many times invitations to new or premium hunting property was contingent on bringing Duke, and he never disappointed. Hunting was our passion, a passion we shared, and that bond became an immeasurable tie that bound us together. Bird dogs are the best hunting partner. They are always ready for a hunting adventure, and are always the last one to quit. A bird dog never wants to sleep in, or stay home because it's too cold. Bird dogs don't get in trouble with their wives because they hunted last weekend, they are always ready to go. 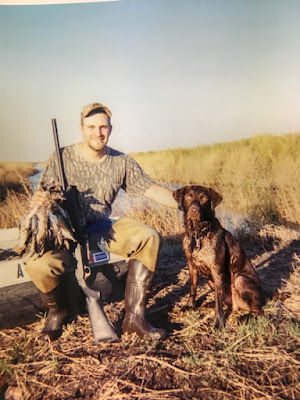 A bird dog doesn't mind sitting in freezing mud and water at the marsh just to watch ducks fly by out of range in the morning and then head off to look for quail in a snowy field that afternoon. I've never seen a good dog quit on a hunt due to a lack of birds, or head back to the truck early because his feet hurt. 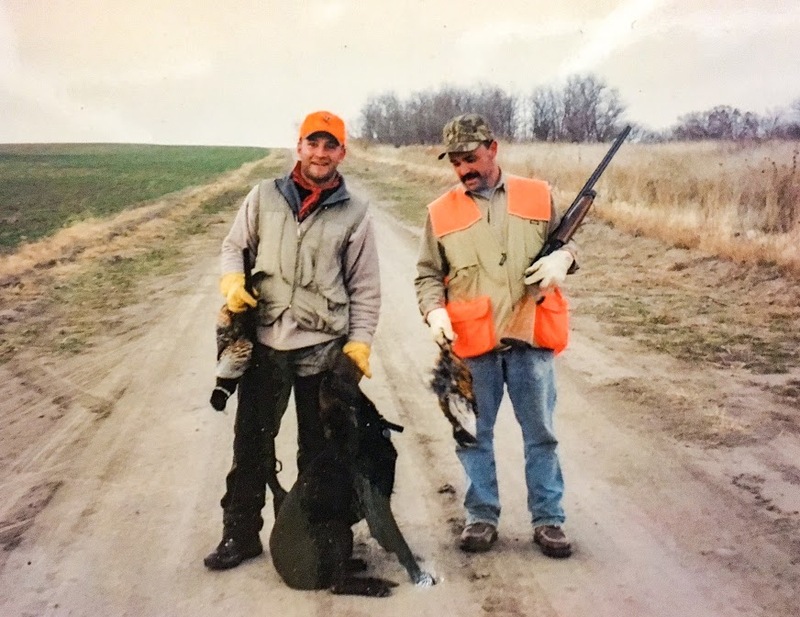 Duke and I hunted hard those years, the miles and the memories are priceless. Duke and I on a pheasant hunt with a great friend. Seasons pass, and years go by. The same was true for Duke and I, and our hunts together. Duke's muzzle turned grey, and his hips and knees began to give out before his heart to hunt would. We began to hunt warm fair weather days, not because Duke complained about the cold, but because it was obvious that the cold caused him pain. The last few seasons, Duke spent his fall and winter seasons resting on a foam bed in our mudroom. During his long afternoon naps, I like to think he was dreaming of a rooster pheasant flush from a snowy thicket, or mallards working our decoys and the retrieve. The sight of a shotgun, or decoys in the pickup still made his tail wag, but his tired body had seen its last hunt. In November of 2015, as migrating flocks of mallards made their way south, and hunters were taking to the fields in pursuit of game birds, Duke went to rest along a hillside bordered by a brushy fence row where we used to hunt quail. There is a simple marker where he is laid to rest, it reads " Duke, My Good 1". It wasn't long until I began to get an itch for a gun dog, and some itches have to be scratched. My life was very different now, married with two young children at home. A hunting dog would be have to be a family dog first. Hunting weekends and road trips are more complicated and involved then they used to be, and schedules are not as flexible as they once were. In December of 2015 Santa Claus brought to our family a perfect little female yellow lab puppy, complete with a red bow around her neck. In an instant we had a family dog with a hunting instinct. Little Wild Man and Littlest Wild Man with their Christmas puppy! There is a sense of betrayal when a new puppy comes into your life after the passing of an old friend. You can't replace an old dog no more than you can forget the great times you had together; at the same time there is a sense of obligation to raise and hunt with a new four legged friend. I like to think that Duke would be happy to know that my hunting days aren't over, and that when I take to the field and hear the wings of a game bird, that our hunts together are a part of that. Meg quickly grew into a fine, strong hunter. She is gentler, and softer in demeanor than Duke was, and perfectly suited to our young family. Her gentleness with her beloved family in no means diminishes her drive for the hunt. Fierce as an upland hunter, and just as steady in the pursuit of waterfowl, her desire to hunt and please her hunters is a joy. 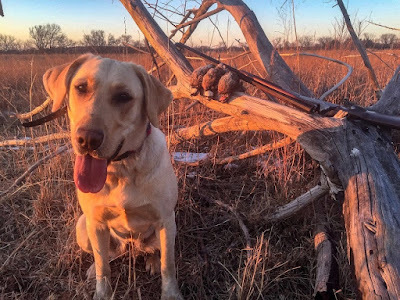 Dogs with a passion not only for the game they pursue, but for their hunter and the hunt are a blessing to hunt over, and Meg is one of those types of dogs. Meg with a handful of quail on the perfect Saturday! Gun dogs bring a certain amount of recklessness, ruckus, and a passion for the hunt to our lives. The partnership and kinship is undeniable, and the seasons we get to share with them are cherished and fleeting. A good dog only has so many Novembers, and by the time the last sunset falls on the last January day of season, we hold onto those hunts just as hard as we look forward to the hunts to come. I pray for the ability to hunt with my heart as hard as the dogs I have been fortunate enough to hunt with have. Meg and I on the last day of the 2018 goose season. Meg's fourth season is in full swing. There are hunts in the works, and a twinkle in her eye everytime she sees me with a shotgun. Little Wild Man is joining us on more and more hunts, and the promise for Littlest Wild Man to tag along is firm. For me at least, a bird hunt is more about the dog than any bird, shotgun, or any other detail. I find a true connection from my center to the heart of a sporting dog and that is what draws me back time after time. Meg and Little Wild Man on the 2018 duck opener with a limit! Follow Modern Wild Man on Facebook! ~ Modern Wild Man ~ Fall is getting started! At Modern Wild Man, fall is one of our favorite seasons! Things start to kick off, and it seems like each weekend there is a new opportunity to get out and enjoy an outdoor adventure! Early teal season is open, I've gotten a chance to get out once, there were no opportunities on teal; but it was a great trip and time at the marsh! I'm excited for some awesome duck hunting this season! Modern Wild Man and Meg at the marsh for the teal opener. The marsh is fuller than I would like to see it this early. After a dryer than normal summer, we received a bunch of late summer rain. The marsh is loaded with weeds and feed for ducks, hopefully the water levels are stable this fall. Here is a video of a carp swimming on the road at the marsh! Carp aren't supposed to be on the road! Little Wild Man got his first pair of waders for this season!! What an exciting way to spend some father & son time this season! I can't wait to pass on the passion! Lots of excited adventures are planned for this fall and winter! Getting out and enjoying the Wild what it's all about! ~Modern Wild Man~ And So It Begins! The 2018 hunting season is underway! Let it begin! Following along with Modern Wild Man you get to join along in lots of exciting adventures. My plan for this season is to post here more often, sometimes short posts and quick pictures of my adventures. Be sure and stop by frequently, better yet sign up for email updates, and don't miss a post! Little Wild Man and Littlest Wild Man getting ready for a whitetail youth hunt! For Modern Wild Man the summer has really flown by! There was time for travel, time for family, and time for fishing! I spent some time horseback, and some time writing and photographing the things that I love. Fall has snuck right up, and is just around the corner! There are great things on the horizon, and exciting adventure waiting on the wings. Please plan to stop by and check in on my latest stomping around in wild places, and hanging out with my wild friends. After years of applying, I was lucky enough to draw a great New Mexico limited entry rifle elk tag. I'm headed there in October, and I hope you'll be waiting to hear about my adventure there. All sorts of things will start happening in just a few weeks. Dove and early teal kick off in September. I'm off to New Mexico in October, and just around the corner upland birds will begin. You can plan on waterfowl, deer hunting, and other great adventures this winter, I hope you'll join me! For now, there is plenty to do, sighting in rifles, finishing preseason preparations, and balancing on the beginning of hoodie and bonfire season! To all my Wild Friends - I'll see ya out there! If you enjoy Modern Wild Man be sure to stop by my other posts here! The Three Bearded Boss Tom! Spring Turkey Hunting Captivates Hunters Year After Year! Chasing Ole' boss Tom turkeys in the spring woods is an absolute rush! The spring woods come alive with gobbles every year, and for those of us with the turkey bug, it's an amazing season. Last turkey season was a tough one for me, you can jump over to Tough Turkey sometime and check it out ... but this season was full of promise. This season was full of strutting toms, gobbles, and some dang good huntin! Tom turkeys are wile and wary, they don't get old and wise by making mistakes. Spring time is the one time of year that old mature gobblers let their guard down in search of a hen. With breading on their mind, tom turkeys sound off with resounding gobbles into fields, along creek bottoms, and into wood lots letting all the surrounding hens know where they are, and any challenging toms know they are ready for a fight. Strutting, gobbling, spitting, and drumming; the spring turkey breading season is a spectacle to behold! I first spotted the Three Bearded Boss Tom two years ago in a green field of spring fescue. The springtime air was still cool from the morning, and the tom fed along the edge of a terrace, gobbling to his hens every so often. Watching through binoculars, my heart raced each time this ole' tom stretched his neck out to feed. A piled up heavy beard dropped down to reveal three beards every time he pecked at the ground. Every little bit this wise old bird would stretch out his neck and fire off a fantastic gobble, then puff up, spread out his fan and show off for the hens with him in the field. I knew then that I had to hunt this turkey! What I didn't know was it would take me two years and lots of encounters to get the job done. Hunting this old tom became a passion. The Three Bearded Boss Tom with his hens. I spent the next two turkey seasons with a mission, with a goal, doing whatever I could to try and make a play on the Three Bearded Boss Tom. I hunted this turkey early in the season, late in the season and everything in between. Many times I was able to get him to come to a call, only to hang up 70 or 80 yards out. A few times I called him inside of 20 yards but there was always a tree, or a rock wall, or a brush pile between us and I was never comfortable with the shot. The Three Bearded Boss Tom was either really smart, really lucky, or a little bit of both. I hunted this bird early in the morning off the roost, late in the morning when most of the hens had gone to nest, in the afternoon hoping for a chance at midday, and even fighting the evening roosting instinct, hoping for a chance late in the day. Several times I called in other turkeys, but they weren't the Three Bearded Boss Tom. I deployed decoys that seemed to only hang him up, I changed calls and tactics from sit and wait to run and gun. This ole' turkey was tough, and that my friends is why I had to hunt him. This turkey and I had a saga, a history, a story between the two of us. A few times he snuck in on me silent and I never knew he was there until I decided to get up and move, then off over the horizon he'd go. He stomped around the same creek bottom spring after spring, and just like clock work he'd be out strutting when the springtime afternoons started to warm and the days began to grow longer. A sign of success this spring! Finally, on a warm and damp spring morning in mid May, I had a chance to close the deal on the Three Bearded Tom. I made my way in the morning darkness across a tall grass field heavy with the evening dew, and as soon as the morning light began to sliver over the eastern horizon I heard a loud gobble from high in an old oak tree. It wasn't long till the morning was in full swing. A doe and her brand new fawn wandered by the edge of the timber I was hiding in. A pair of owls fired off hooting down the hardwood creek, in turn sounding the tom off with a gobble each time they called. The tom turkey pitched down when the sunlight began to stream through the broken skyline, not long after, a lone hen scratched out a yelp and off they went. I figured the rest of the morning would be spent reading a paper back under a tree and waiting for my tom to return, but it was only a matter of minutes till he gobbled at me again and he was moving my way. Armed with a hollow wooden box with a nail in it, and a striker stone; I made a series of soft clucks and an easy yelp. The tom covered up my calling with a loud gobble, and I quickly knew that the hunt was on. With a few more soft calling sequences trying to convince that old wile bird that I was a lonely hen, he gobbled every time I called but he wasn't interested in looking for me. There was an open meadow between the bird and me, and I knew that he had my location pinned down. My options of trying to close the distance were slim. In nature the tom calls to the hens with his gobbles and the hens go to him. The hunter works on the toms instinct trying to get him to come to a stubborn hen, sometimes it works. Quickly I came up with a plan to close the distance. A deep banked creek dropped off just to my right, and acted as a hidden path between the timber I was in, and the stronghold the tom was gobbling from. Crawling on my hands and knees I slipped down into the creek, wading into water just over the top of my boots. The cold water seeped in over my boots, soaking my socks, but the hunt was worth the discomfort. Slowly and quietly I crept along the creek, staying tight to the dirt bank 8 feet or higher between the turkey and me. Slipping along slowly, I closed the distance and carefully found a place to climb up out of the creek bottom, hidden by the may foliage. Silently I slipped in behind a few small cedar trees, not knowing where that ole' turkey was, but knowing he was close. Carefully I scratched out a soft yelp with my nail call, and the Three Bearded Tom answered back before I could finish. He was close, really close, close enough that I could feel his gobbles on my chest. Knowing this turkey's history with hanging up and not coming in close, I decided to play hard to get. It didn't take long till the tom gobbled, and gobbled again, looking for the hen he heard call just off behind a few trees. Up till now, I still hadn't put eyes on the tom I was hunting, but I had a good feeling that it was the tom I'd been after for so long, maybe it was just wishful thinking. Watching through the green leaves and around every branch and shadow, I saw movement 40 yards out through the timber. Along a gentle rise near an old well with an old hand pump I heard the tell tale spit..... and drum. Just above the rise a red and blue head appeared in front of a magnificent fan filled with the morning sunlight. I sat in the spring woods, full of gratitude and immersed in the hunt, then 30 yards in front of me that magnificent tom stretched out his neck to gobble and three beards hung down from his breast. With the bark of my 12 gauge, my hunt was over. The Three Bearded Boss Tom gobbled his last time, and I was filled with excitement, gratitude, pride, and a sense of closeness with this turkey, the woods, and the springtime. After years of pursuing this wise ole' tom turkey, I was finally able to hang my tag on him. Just like that, my turkey season and the hunt for the Three Bearded Boss Tom was over. Summer is under way now, and fall can't come soon enough for those of us who long for hunting days in the field. You can bet though, that next spring, I'll be in the turkey woods looking for a boss tom with a shotgun and a nail call, hoping to put turkey dinners on the table! Big Ole' Tom Spur Hanging from the well pump. Antelope Recipe that is SO SO Good! A heaping plate of biscuit and gravy goodness! 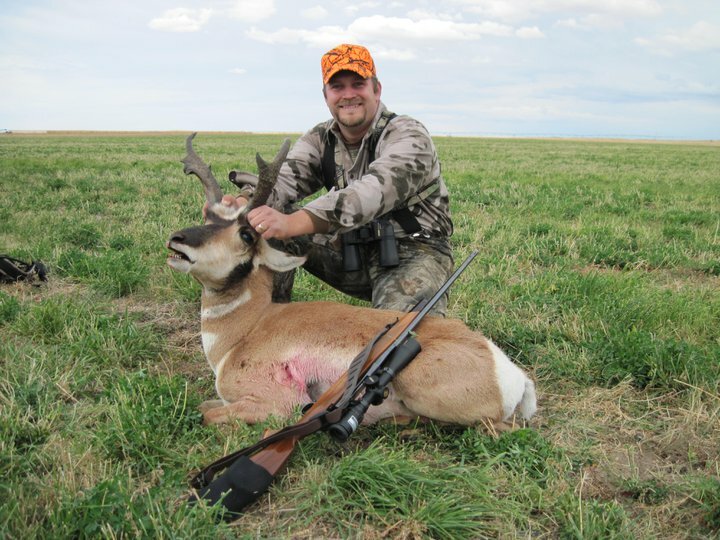 Antelope Hunting is an Awesome Experience! The American Pronghorn Antelope is an amazing big game animal of the west. These tough as nails survivors of the Western Plains are surprisingly easy to kill, but notoriously hard to hunt. I thoroughly love hunting pronghorn, hunts for these truly American animals generally take place during early fall when the weather is fantastic, pronghorn are plentiful in many states, and they are first-rate table fare. Lewis and Clark wrote of the American Pronghorn Antelope: " Of all the animals we have seen the Antelope seems to possess the most wonderful fleetness. Shy and timorous they generally repose only on the ridges, which command a view of all the approaches of an enemy ... When they first see the hunters they run with great velocity." Pronghorn are found only in North America and epitomize the vast spirit and temperament of the West. At the Modern Wild Man house, few things are as high ranking and treasured than a weekend brunch. A warm plate of Pronghorn sausage gravy covering homemade biscuits might as well be the picture of "Comfort Food". A cheerful meal in any season, try this simple recipe for your family and add it to the brunch tradition at your home. A great non-typical pronghorn under a Western sky! Pronghorn sausage ready to brown in a skillet. In a heavy black iron skillet over medium heat melt 1T of butter and add in the 1 pound of Pronghorn sausage. Cook the sausage until just browned, be careful not to overcook it. Once the ground meat is browned through use a slotted spoon to remove it from the pan, and transfer it into a bowl for later. Next, add in the remaining 2T of butter to the skillet with the browned sausage drippings. Heat the butter till it is just bubbling, being careful not to burn it. Slowly begin to shake in the 1/2 C flour into the hot butter and stir with a wooden spoon. Take your time adding the flour to the butter to avoid lumps. As the flour browns into a rue it will take on a light brown, getting darker as you continue to cook it. I like my rue to be a golden brown, about the color of a oak tree acorn and with a beautiful fragrance. Be careful when browning the flour so that you don't scorch or burn it. Once your rue is to your liking for color and browning, turn the heat down to low or medium / low and begin to slowly whisk in the milk. Take your time and mix the milk in slowly so the milk doesn't scorch and you don't get lumpy gravy. Pour in the milk reserving 1/2 C. Once the gravy thickens, use the last 1/2 C to adjust the thickness to your liking. Finally, add back in the browned pronghorn sausage to the warm gravy and heat everything back up over low heat. Continue to stir being careful not to let the bottom of the pan burn. In short order you will have a bubbling pan of gravy goodness. Warm sausage gravy just waiting for a biscuit. A couple of secrets to perfect biscuits are keeping the butter cold, and handling the dough as little as possible. I like to put the butter in the freezer about 20 minutes before I'm ready to make biscuits, and I like to use a heavy glass or ceramic bowl from the fridge to mix in. Combine all the dry ingredients into a large chilled bowl. Cut the chilled butter into smaller chunks and cut into the dry ingredients using a pastry or biscuit cutter until it resembles coarse meal. Pour in the chilled buttermilk mixing it in as little as possible but thoroughly combine. If the dough seems a bit dry, add in a little more buttermilk. The dough should be sticky, not dry and not runny. Turn the ball of dough out onto a floured board or countertop. Pat the ball out flat, do not roll with a rolling pin. Once you have the dough patted out to about 1/2" fold it onto itself three or four times. Finally pat the dough down to about 1" thick. Use a knife to cut square biscuits or a biscuit cutter or overturned glass to cut out round biscuits. Place the biscuits onto a very lightly floured cookie sheet, touching one another for soft sided biscuits or an inch apart on the sheet for crusty sided biscuits. Bake them in a preheated 425 degree oven for 10-15 minutes depending on your oven. Be careful not to overbake. Once you have this process figured out you will be whipping up Blissful Buttermilk Biscuits in minutes for an amazing weekend brunch! A pan of biscuits just out of the oven. Pronghorn Antelope hunting in the west is a ton of fun! If anyone asks me what is the best way to get started hunting in western states, the answer is always the same - put in for an antelope tag. Most of the west has ample public access and healthy populations of pronghorn. I hope you are able to get out sometime an put your tag on a western pronghorn and serve up a sausage gravy and biscuit brunch for your family! If you are into western hunting check out this Modern Wild Man Elk Hunt! Don't forget to follow Modern Wild Man on social media. Filling the freezer with Little Wild Man!